Established in 1974, Sunway Group is one of Malaysia’s largest conglomerates with core interests in property, construction, education and healthcare. We are a 16,000-strong team operating in 50 locations worldwide, pulling together to improve the quality of life of our communities through 12 business divisions – property, construction, retail, hospitality, leisure, healthcare, education, commercial, trading and manufacturing, building materials, quarrying and Real Estate Investment Trust (REIT). Our three public-listed companies — Sunway Berhad, Sunway Construction, and Sunway REIT, with a combined market capitalisation of RM 17 billion — form a real-estate value chain that exemplifies socially responsible business practices, evidenced by their listing on the FTSE4Good Bursa Malaysia Index. 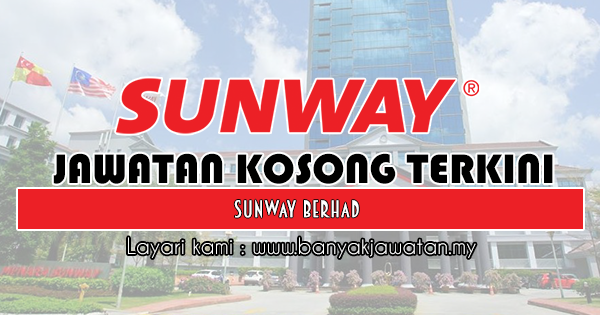 0 Response to "Jawatan Kosong di Sunway Berhad - 13 Februari 2019"